11 Tips for Organizing your Kitchen Cabinets in the most ideal locations. INSIDE : Tips for How to organize Kitchen Cabinets based on their contents. What items go where and in the most ideal locations as possible. The perfect how-to for your kitchen cupboard layout! About a month ago, I posted about how I cleaned up a few of my kitchen cabinets in 15 minutes! There were so many questions about where things go in your cabinets and cupboards, so I decided to share how I organize my kitchen and the best place for everything to live. 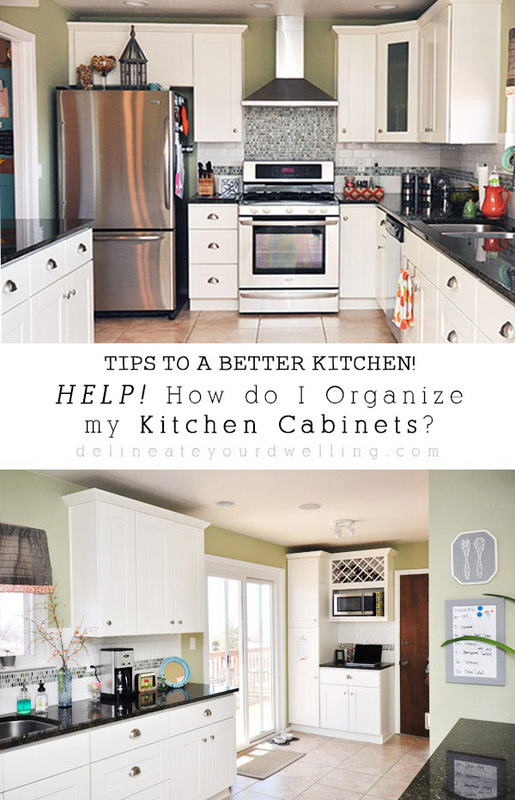 So, today I am sharing Tips for Organizing your Kitchen Cabinets and Cupboards, as well as setting them up in the most ideal locations as possible. Are you ready for some serious Organizing Kitchen Cabinets? You can scroll to the bottom of this post to see a diagram for each of these zones. Okay now let’s get to it! 1. Rarely used “fancy” items. If you have fine china, fragile glassware and that one punch bowl from your wedding registry (We all have at least one of those. ), those items should not be taking up prime cabinet real estate in your kitchen cupboards. Start by carefully arranging your rarely used items as they can best fit on the less accessible upper cabinets. 2. Pots and pans that receive daily use. Typically, there are decently sized larger kitchen cabinets nearby to the stove which are ideal for heavy and bulky pots and pans. In our kitchen, we have our pots and pans as close to the stove as possible. They all live under our center island. It is an easy reach to turn around and grab a pot and put it on the stove top. Try to put the pots you use most often closest to the front of the cabinet and your random asparagus steamer (Yes, we have one of those too.) can be stacked farther back. We bought a two packages of these red Cookware Protectors a few years ago and I swear by them! We recieved decently nice cookware for wedding gifts and even after our ten year anniversary, our pots and pans still look just as good as the day we got them! These cookware protectors have really made a huge difference in avoiding daily bumps and scuffs while in your cabinets. Update : We celebrated our 12th wedding anniversary and ALL of our cookware looks fabulous because of these red protectors we daily use. Another inexpensive item that I bought and has HUGELY helped organize is this pot and pan lid organizer . It takes up very little space and I never have to search high and low for the appropriately sized lid any more. Game changer. We’ve also had this little gem for over 10 years and I wouldn’t organize my lids any other way. Also, you know how somehow you end up with 18 extra pot lids that don’t fit a single pot or pan in your kitchen? Using an organizer like this, really makes me take note if it’s a spare (get rid of) or a lid we actually use (put it in this organizer). If you are fancy and have room for a hanging pot rack, all the better! We do not have space to accommodate that but it would be lovely. 3. Eating and Serving Utensils. Ideally if the space is available, all of the eating and serving utensils should be located nearby to the dishwasher. We, however, do not have a drawer that fits silverware near the dishwasher. All of our utensils are above the pots and pans in a flat drawer on our island. The idea behind silverware being near the dishwasher is that you can open the drawer and easily place clean utensils right in. A lot of kitchen cabinet organizing is about ease of access when needing to use, clean up or put away. 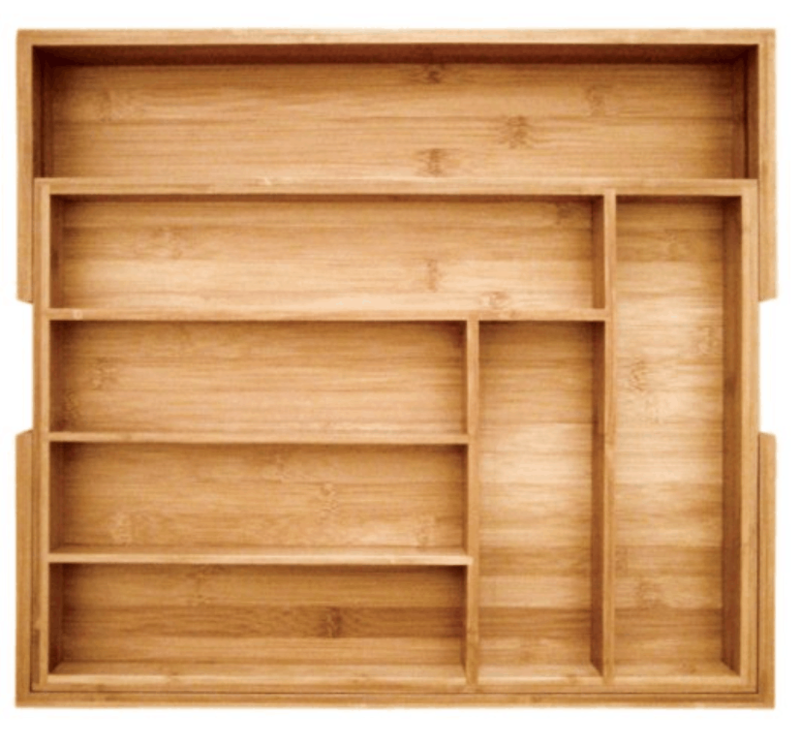 We bought one of these Bamboo Expandable Organizer to hold everything and it works so well. It’s expandable so it fits any sized drawer and it has held up perfectly after all the years of use. We loved it so much, we actually bought another one for our “junk drawer” that holds batteries, birthday candles, etc. I have seen a bunch of people use bamboo dividers very successfully, also. They are a great way to organize a drawer if you either can’t commit to an exact organizer or if your drawer’s dimension won’t fit a standard organizer. 4. Everyday dishes and bowls. Everyday dishes and bowls are located on the upper cabinets near the dishwasher, this is another ease of unloading the dishwasher location. It’s nice to open the dishwasher and be able to place all the main dishes without having to move around much. They should also be easily accessible for getting out and setting your table for meals. The area under the sink is a great place to store everything you need to keep your kitchen clean. Trash bags, cleaning solutions, rubber gloves, extra dish soap and detergent, extra sponges, can be placed here. And if you have small children, it is wise to purchase a lock for these doors. Often, people also store their trashcan under the sink as well. If you have the luxury of space, you can store your trash can in it’s own pull out cabinet. We have ours sitting out at the end of our cabinets. It’s not ideal, but it’s the only space we had available. 6. Cookie Sheets, muffin tins and pizza stones can be stored under the stove. Some like to store their baking sheets and tins standing up with dividers. If you have room, that is a great option. In all the homes I’ve lived in, I’ve just stored them under our stove in the shallow drawer at the floor. It’s nice to have cups and glasses near to the refrigerator. I also have a small bottom pull-out drawer that I store all my kids cups and silverware. I like teaching them to set the table and these are down low for them to easily get at. If a wide shallow drawer is available, this is an ideal space to contain placemats. I use quite a bit of fabric napkins and have more table runners than a person would need. All these types of tablescape items are best kept together for quick use. 9. Oils, vinegars, and taller spices. While cooking away at the stove, it is nice to not need to leave that spot to run and grab your oils, vinegars, and salt, pepper, etc. I found a fun container at Home Goods and it sits on the counter top to the right of my stove. 10. Cooking utensils, knives, and everyday spices. As I shared in my 15 Minute Kitchen Cabinet Organizing post, I store all my baking, cookie ingredients and spices/sauces on upper cabinets on either side of my range. 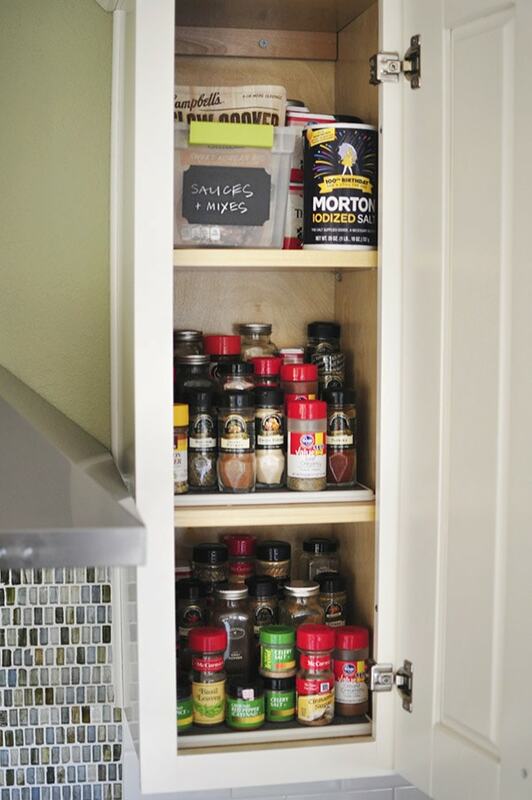 This 3-Tier Cabinet Organizer has been huge in keeping all of our spices visible and organized. All of our cooking utensils and spatulas live in a lower cabinet drawer to the left of the stove. This was they are easy to grab while stirring a delicious soup! 11.Dry goods and the food pantry. If you have a pantry space, other than small spices or baking items, keep ALL your food together in that area. Prior to updating our kitchen, we had to store all our canned goods, chips, noodle packages, etc in upper cabinets. Sometimes that is all you have the room for, so if that’s the case, do your best to organize it and make it work for you! We have these larger tiered organizers for our dry goods and soups. 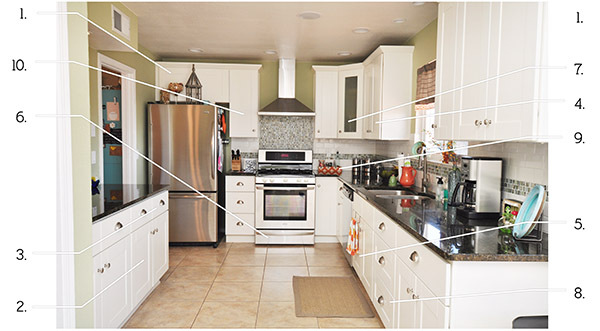 Here is a diagram of the basic layout of our kitchen cabinets in relation to each other. Now that you know more than you ever wanted to know about the insides of my kitchen cabinets, hopefully you’ll feel a little more confident opening drawers and switching things around in your kitchen! Do you have any other fun Organizing Kitchen Cabinet secrets? Be sure to share below! Your title grabs my attention. I actually want to organize my kitchen cabinets but couldn’t find proper guidance. Thanks for sharing precious post that will help in organizing kitchen cabinets. I’ll definitely be following these tips and tricks. Great tips! It really helpful for Kitchen Cabinets Online buyers. This is simply amazing. I will include this on my list. Thank you for taking time writing this informative post. I appreciate the ideas. Keep it up! Thanks for coming up with these fundamental ideas for a kitchen cabinet. You really gave me some ideas and thoughts to consider in improving my kitchen. I like how your prioritize your most-used items. This is something we definitely need to do as I somehow always end up with those bowls and pots and pans we don’t need getting in the way. I live in a home with a MUCH smaller kitchen now and it seems even more important to keep the most used items together. It’s the little things that make a difference! I am amazed! Maybe, just maybe, I will do this one day. Thanks for all the great info and tips! Great ideas. I need a pot lid organizer. My favourite organized items in my kitchen are that my spice cupboard is organized alphabetically so I can always locate any spices. I separate the rows with chopsticks to keep them lined up nicely. I also have a square plastic container full of bagged spices on the top shelf, also organized alphabetically. Works great. My baking cupboard I use large containers that I can slide out that hold brown sugar, icing sugars and similar items, another holds various types of baking chocolate, melting chocolate and chocolate chips. Always easy to find and organized. Two baking drawers hold icing tints, rolling pins, decorating tools, measuring cups and spoons and all decorating tops in one place organized in dollar store organizers. Stays neat and tidy. 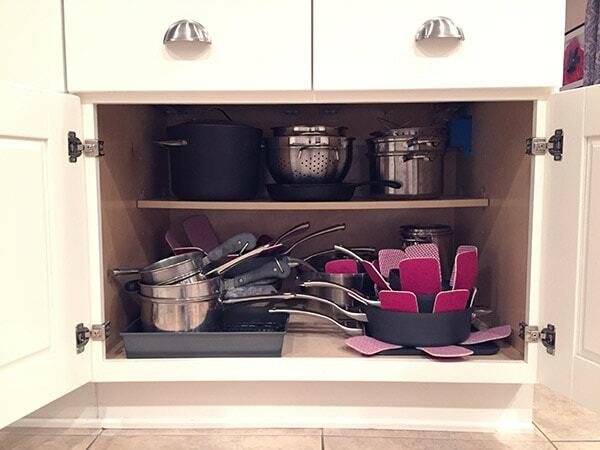 I second you on the pots and pan lid organizer…it is a game changer! 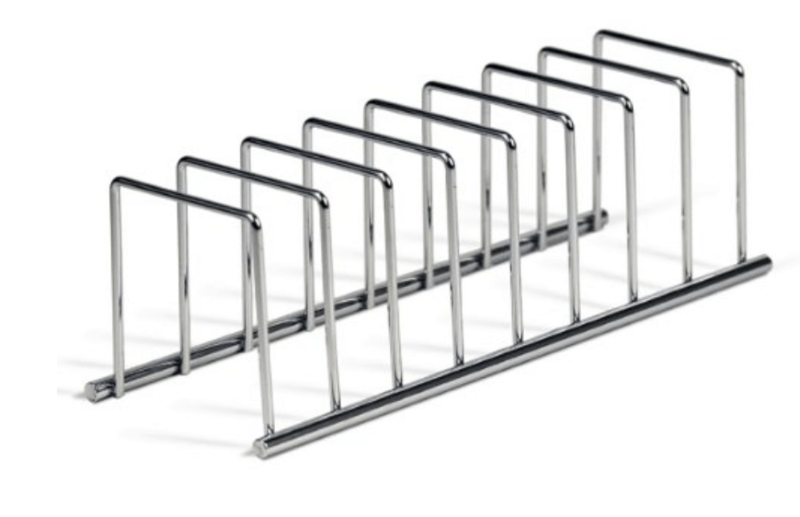 Have you ever used a pan organizer that stacks your pans and separates them? We got one at Target and it has made it SO much easier for me to get my most commonly used pans out of the cabinet! Oh! I’ve not, I’ll have to keep my eyes open for that, sounds super helpful! And yes, punch bowl, I had mine from when I was 18. I haven’t used it more than twice in the last 10 years, so I released it into the wild. Watch out! It’s a wild punch bowl on the loose… haha! Thanks for sharing, Melinda! Thank you, Amy! You gave me great ideas!!! <3 I checked the links you shared and I think that I'm a big fan of your blog now! Well so happy to hear it! Thanks Suzanne. Great tips Amy! I really need to get one of those pot lid organizer. We also bought the bamboo expandable organizer and I really love it. It’s a nice upgrade from the small plastic ones and I’m thinking of getting one for my “junk” drawer too! In my old house I didn’t have any room for any of my fancy serving bowls, trays, etc, but since I have a little more room now I moved them exactly where I can see them and have been able to use them a lot more. Sometimes just have to work with you got though. Btw I love your kitchen!!! Especially the little arched area! Thanks, Reshma! It’s crazy how sometimes the most simple organizers really make such a big impact! Our kitchen was pretty bad for many many years… the end result took months of hard work (mostly by my husband as I was pregnant with our first child at the time) but we saved SO MUCH MONEY by doing it all ourselves!